"Using mozzarella cheese, chicken broth, garlic and onion, this is a variation of Chicken Parmesan created for my son, who doesn't like the standard version. 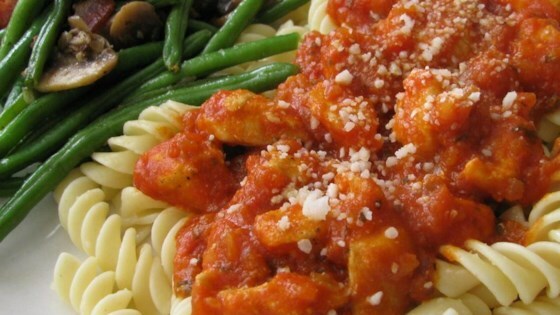 This dish goes fast in our home, served with hot cooked pasta, salad and crusty Italian bread." Heat oil in a large skillet over medium high heat. Saute chicken breasts for 4 to 5 minutes each side, or until white. Add pepper, garlic, onion and broth. Cover and simmer over medium heat until broth cooks off, about 7 to 10 minutes. Stir in spaghetti sauce, then cover and simmer another 10 minutes, or until chicken is cooked through and no longer pink inside. Sprinkle cheese on top, cover and cook for another 2 to 3 minutes, or until cheese is melted. Serve hot. Baked chicken is glazed with honey mustard and topped with bacon and cheese. This was just okay for us. I would not make again. The flavor was too bland and it was basically just chicken and sauce. My husband and children loved this. I made the major of it while trying to sooth and breastfeed my 9 week old--easy! Thanks!